The Board of Trustees of Hadassah International Israel would be honored by your presence at the Annual 2016 Gala Evening “To Our Soldiers with Love” on Wednesday, September 14, 2016, at the Charles Bronfman Auditorium in the Hechal Hatarbut in Tel Aviv. 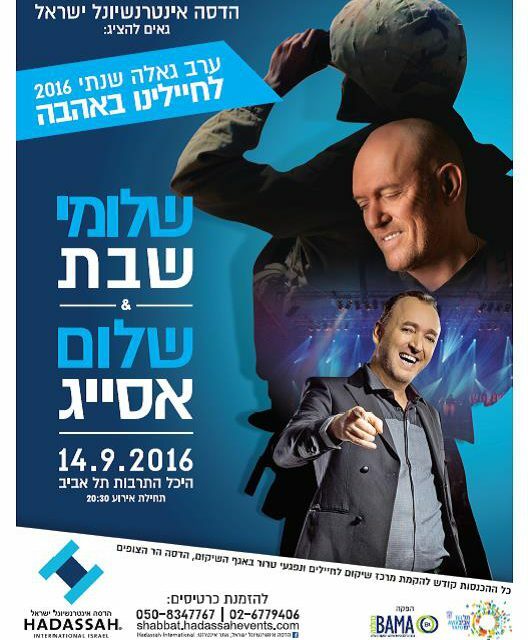 Comedian Shalom Asayag will be on stage, Music is provided by the renowned singer Shlomi Shabat. The Event will take place to benefit the rehabilitation of soldiers and terror survivors at the Hadassah Mount Scopus Rehabilitation Center. Website Visitors speaking Hebrew can purchase their tickets here. For orders in all other languages, please contact us at communications@hadassah.org. Thank you!